THE DEVELOPERS of the old ice rink site have appealed against the planning committee’s refusal to grant planning permission for a block of flats. 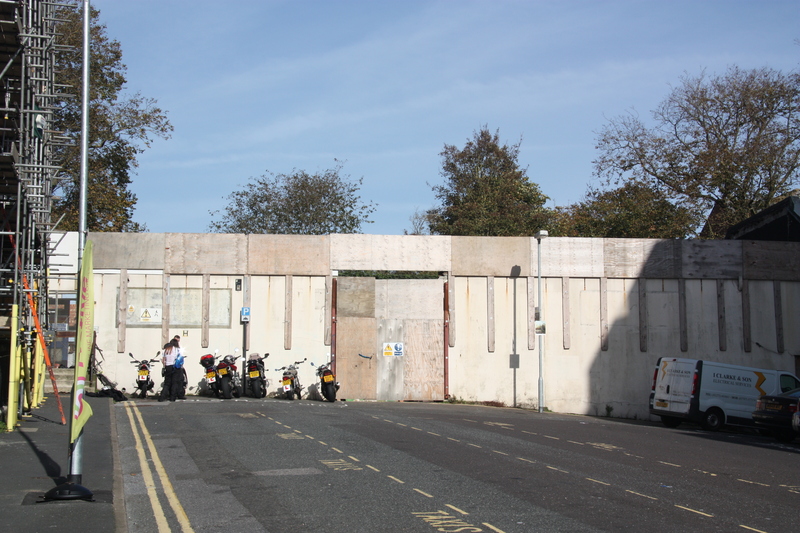 Plans to build a six-storey block of flats and offices on the site of the old ice rink in Queen Square were thrown into disarray after the planning committee rejected the latest planning application at its meeting in October, against the recommendation of officers. The appeal is the latest twist in the tortuous tale of attempts to develop this site. The ice rink closed in 2003 and the site is owned by the council. It was sold to Stonehurst Estates subject to planning permission. Stonehurst Estates had originally planned to build a six-storey hotel with 56 rooms on the site. This plan generated widespread opposition, because of its impact on Wykeham Terrace and St Nicholas’s church as well as its historic churchyard. Wykeham Terrace is grade II-listed. St Nicholas Church, which originally dates from the 14th century, is grade-II* listed and many of the tombs in the churchyard are grade-II listed in their own right. The hotel plan was narrowly approved in June 2012 by the planning committee in controversial circumstances. The officers had recommended approving the plan. But in a shambolic meeting the first vote was tied five-all with two abstentions. The plan was then rejected on the casting vote of the chair. After the committee had failed to agree on the reasons for rejecting the scheme there was a second vote and this time the plans were approved by seven votes to five. In November last year the developers finally admitted that they could not obtain the financial backing to build a hotel. So the hotel plan was scrapped. Instead Stonehurst Estates, after talks with the council, proposed to build a six-storey block with offices on the ground floor and flats above. The block of flats was similar in size to the hotel—and designed by the same architects—the Brighton office of Conran and Partners. The Wykeham Terrace Residents’ Association, the Regency Society and the MCHA all objected to the block of flats, because of its height and its impact on the nearby listed buildings and the conservation area. The flats would be slightly closer to Wykeham Terrace than the original hotel plan and would largely rob the rear of the terrace of its morning sun. These objections were also echoed by the council’s Conservation Advisory Group. The council’s own heritage team also said that the height and mass of the building would cause harm to Wykeham Terrace and may cause harm to the church of St Nicholas. Two residents of Wykeham Terrace spoke at the planning committee meeting. They objected to the bulk of the building saying that it would tower above the listed terrace. They were supported by the local ward councillor for St Peters and North Laine, Lizzie Deane, who also said that the sheer scale of the building would impair views of the churchyard. The plan was widely expected to be a shoo-in and the council’s planning officers were quick to assert that the issue of the bulk of the building had been settled by the committee’s previous decision. But the councillors decided to reject the officers’ advice. The vote went across party lines with, two Conservatives, two Greens and two Labour councillors joining forces to defeat the plan. There was one abstention. The reasons given for rejecting the plan are the impact on the listed buildings of St Nicholas church and Wykeham Terrace, the impact on our conservation area and the loss of light at the rear of Wykeham Terrace. The developers have now appealed against the planning committee’s refusal.